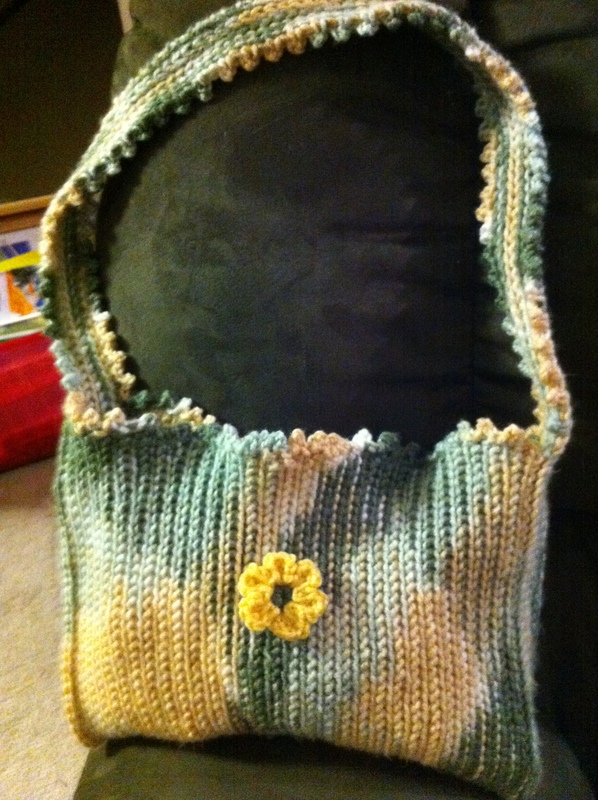 I found this free pattern at Lion brand’s website for an easy Crochet Tote Pattern #90561. I linked to their site but you probably have to register for a free account before you can view it. It is easy to do and lets you see all of their great free patterns. I have several bookmarked to work on later. You can bookmark them right in your account. Anyway, I wanted to make a tote bag for my library books. They made this in a solid blue (worsted weight) but I’m going to make it in a variegated yarn that I have that has no label. It is worsted weight though. Anyway, the colors are a light sage green, a lighter green, white and a pale yellow. When I’m finished I’m going to embellish it with flowers or something. 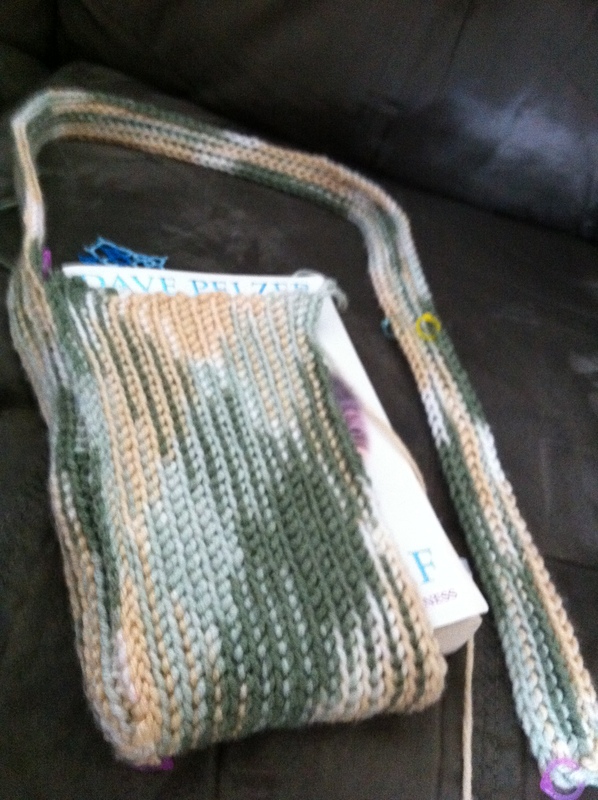 I’m working on the gauge swatch now (like the good girl that I am) so I can be sure it will be big enough. I’ll keep updating this post as I go. 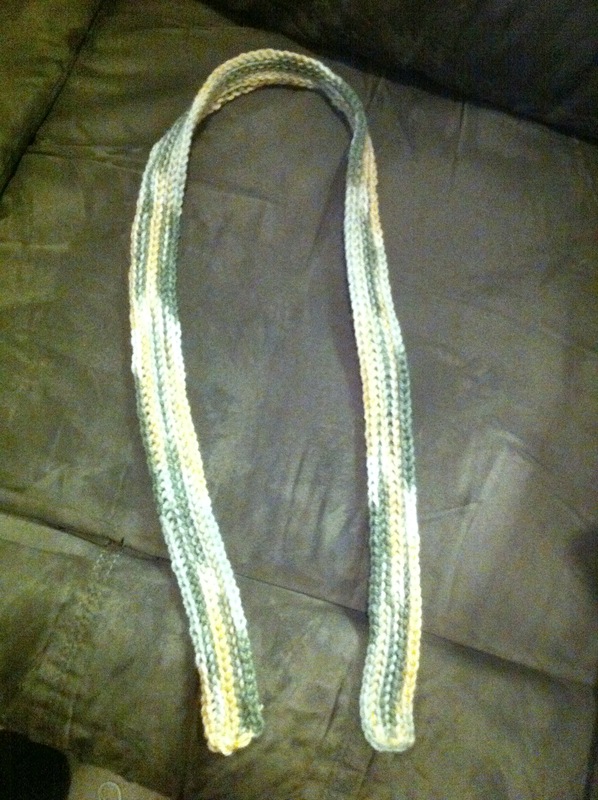 April 3rd – I just finished making the strap. The colors on this picture are more accurate. 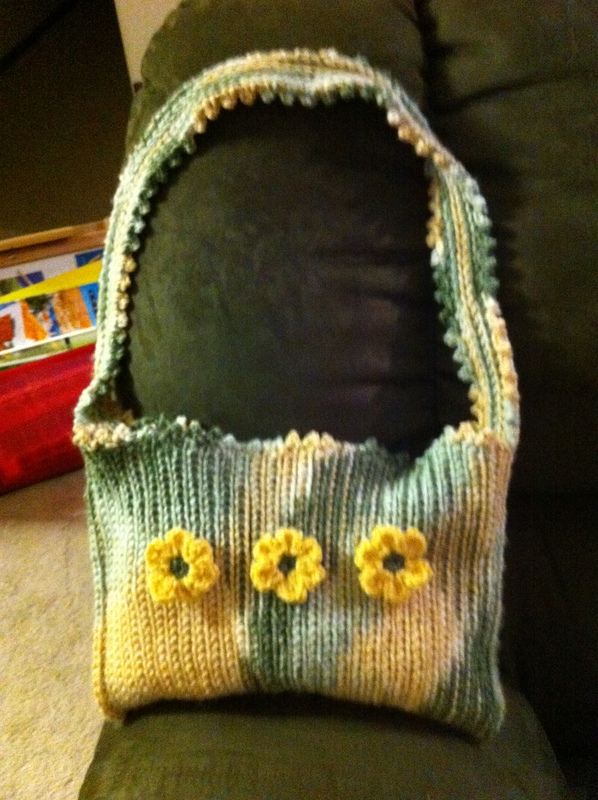 The rest of the bag is crocheted from the lower section of one side of the strap and connected to the other. I’ll start that tomorrow. Okay, so it’s Tuesday the 5th of April and I have part of the body done. It’s only about 4 inches and I need to keep going until it’s 13 inches. I haven’t been feeling well and I’ve been sleeping a lot so I didn’t get as much done as I would have liked. I put a book in the bag so you can see the shape better. I didn’t realize until I got further in the pattern that you don’t just work on one side of the bag and then do the other. You actually start on one side of the strap working down the length of it, then you go around the bottom (narrow end) of the strap and along the other side of the strap until you get even with where you started on the other side. You keep adding rows this way which creates both sides and the bottom of the bag at once. Then when you get to the other side you just join to the other end of the strap. 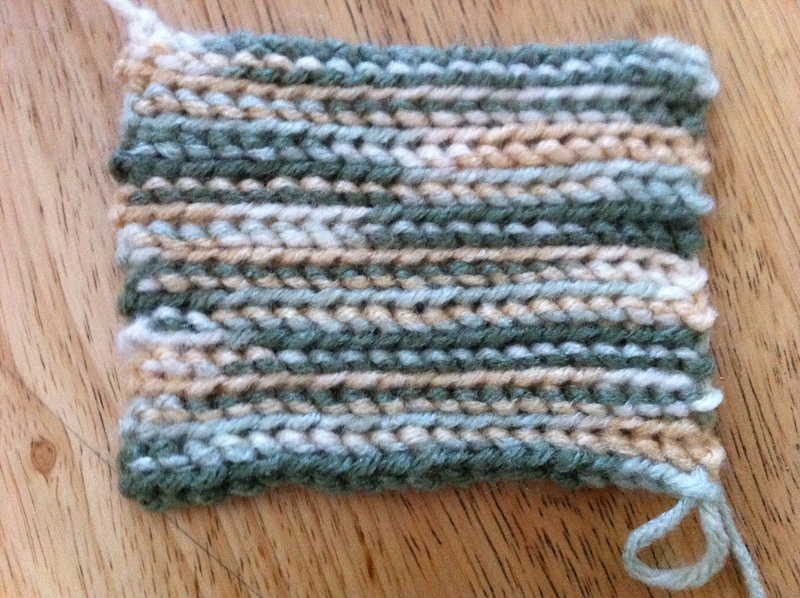 I love the pattern the variegated yarn is making. So, I don’t think this bag will be big enough for what I intended it for – a library book bag – but it will be perfect for carrying A book, my wallet and a few other small things. I really like how it’s turning out and can’t wait until it’s finished. 4/13 – I’m finished! It ended up about 9 x 12″ so not many books are going in there. It’s 3:am but once I saw that I was almost done I couldn’t quit! I jazzed up the edges with some small picots and added some (removable) spring flowers. I’m not sure if I like one or three so I have pictures of both. I think I’ll put the flowers on pin-backs so I can put them where ever I want and ditch them when I’m ready. Now I’m officially ready for spring.